Fearless. I was almost certain this was my word for 2014. Almost. I started questioning whether this was my word for me or God’s word for me about two weeks ago. I reread One Word that will change your life and knew without a doubt that Fearless was my word for me and not His. After a lot of prayer and needs assessing, I realized Fearless isn’t my word for 2014. I’ve placed too much emphasis on addressing urgent needs rather than important needs. I’ve given up important things like leading a Bible study and volunteering in youth ministry to spend almost every waking moment working on urgent issues at work. I begrudgeonly realized as I lay in bed exhausted and sick during the Thanksgiving Break, that even if I worked 12 hour days every day of the week, I’d NEVER get caught up on all the “urgents.” And that made me angry. 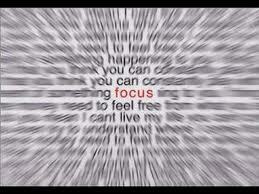 I analyzed my needs and I paid close attention to the verbs: be, focus, concentrate, improve. I looked at the obstacles that are keeping me from addressing my needs: urgent issues, lack of planning/poor time management, ego. Finally, I committed to letting specific things go. First & foremost: excuses. Which helped me see where God is leading me in 2014. My word for 2013 was Compassion. I learned a lot as I tried to live a more compassionate life. Namely: when you pray to be more compassionate, He provides ample opportunities for you to learn. Where will I be in my walk with Him on Christmas Eve 2014? No telling. I shared a heart cry with my Circle of Friends several weeks ago. I remember it as vividly tonite as I did when God whispered it to me on that quiet morning: Lord, mold me into the vessel You want me to be and help me accept it. And tonite I add: and Lord, keep my focus fixed solely on You.